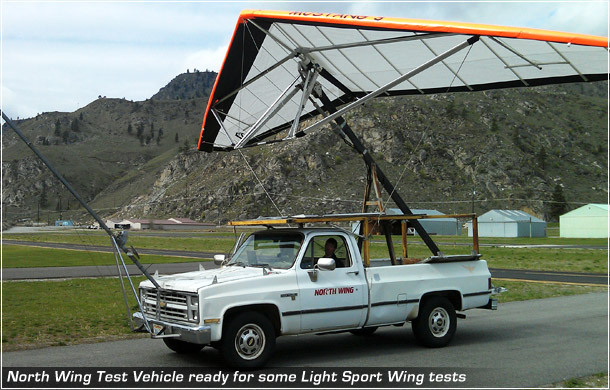 North Wing designs and manufactures quality weight shift control Light Sport Aircraft, FAR 103 Legal Ultralight Trikes, Wings for Trikes, Hang Gliders, and a wide range of accessories for ultralight trikes and hang gliders. 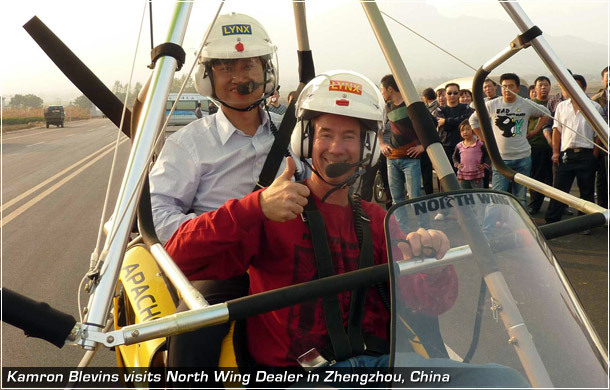 North Wing founder Kamron Blevins has been a member of the Hang Gliding Manufacturers Association and has certified many hang gliders. He brings this experience of flex wing design and flight testing to North Wing. 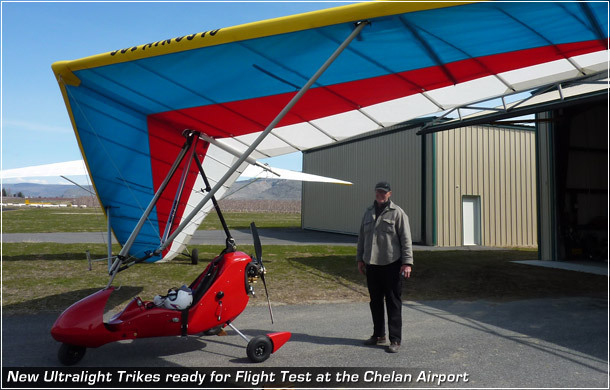 Kamron and our team of qualified associates will bring their experience in customer service and manufacturing to build you one of the best Light Sport Aircraft, Ultralight Trikes, Trike Wings or Hang Gliders in the world... built with the highest quality Aircraft Grade hardware and sailcloth. By applying experience from years of refining Hang Glider sail design, North Wing founded a reputation of having the trike wings that handle much better then even the longer established European wings. 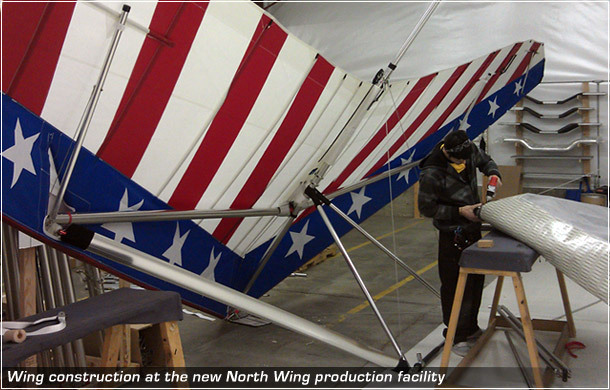 At that time in 1996, we made only wings; we were building one or two wings a week... what a difference compared to now, as our customer-driven growth in light sport aircraft, ultralight trikes, wings, and hang gliders has required that we recently moved into a much larger production facility to meet demand for our aviation products. 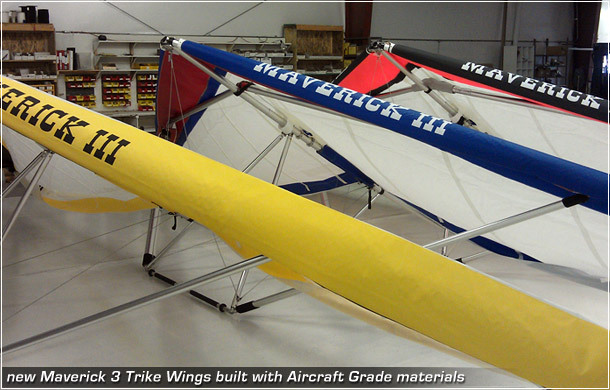 In 1998, we designed and built our first single place trike (the Maverick) featuring a strutted wing. North Wing has been making strutted wings long before our competitors, and we are constantly introducing innovations that increase flight performance, safety, and reduce costs when possible. At North Wing, our main design criteria is to offer you a choice of wings that deliver easy handling, making them fun to fly. On our quest for optimal safety, we feel our #1 goal when designing wings is precise control and handling even at low speeds. When conditions out there get a little rough, we hope you will agree handling is going to be your biggest concern. Each wing design must pass specific parameters such as coupled feel in handling between pitch and roll, and a nice gentle stall. These handling pressures must fall within our tough guidelines. We feel these unique qualifications will instill confidence even when flying in turbulent conditions. Countless hours of research in sail, frame, and airfoil design have given our wings one of the largest speed range in the industry. So when you are on your way back to the airstrip and hit that dreaded head wind, you will be relieved to have chosen a North Wing aircraft. When you do choose a North Wing aircraft, you'll be happy to know you will never have to be a test pilot, as we Test Fly and tune every wing that leaves this factory. We have manufactured thousands of wings and hundreds of trikes. We are proud to have hundreds of Pilots who have enjoyed thousands of hours flying in our aircraft. Our goal has always been to have our customers happy flying our products. If they are not happy... then we are not happy. Whenever possible, we try to find out why any customer is not satisfied and do what we need to do to ensure their issues are resolved, and enjoying North Wing products. In order to keep the fun in aviation, you need to be flying an aircraft that is not in questionable airworthiness, and fly within the parameters of the aircraft and YOUR limits. We can't stress enough - the importance of maintenance of these older aircraft, especially the wing. Getting the wing to a qualified wing mechanic or sending older products to the factory to have a complete sail off inspection is very important. Every two hundred hours, you should do very thorough inspections. Back when all trikes were "Ultralights" and maintenance was at the discretion of the pilot, we have found that maintenance could be nonexistent in the life of the trike and result in someone being hurt or loss of life. These tragic incidences could have been avoided with better owner care. Even though many ultralight manufacturers resisted the new Light Sport program, it has created a policy to ensure maintenance is being done, so some accidents (though few, and one is too many) can be avoided. North Wing became part of the committee and brought twenty years of designing and testing wings to work on Light Sport standards. North Wing, having started from the Hang Gliding side where Wing Testing was normal with HGMA standards, we continued to test our trike wing to a wing standard used in France since we had started in 1996. North Wing has now embraced the Light Sport process and has benefited by Light Sport standards... and you will too by choosing a North Wing product for your next aircraft. 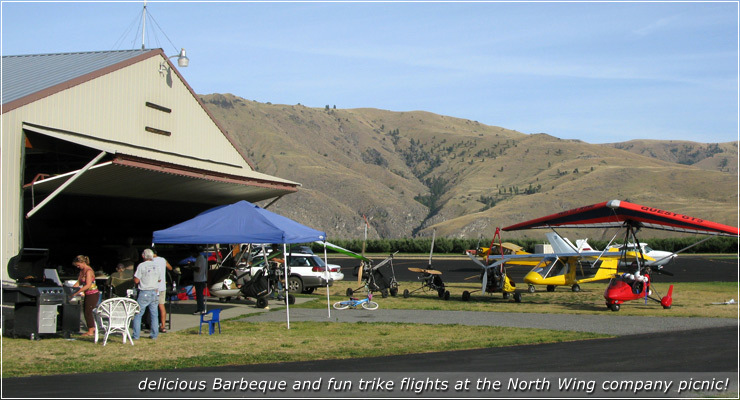 Something to consider when looking for a quality Light Sport Aircraft or Ultralight Trike is spare parts. North Wing is an American company, and we maintain a large inventory so parts availability is only a few days away. Everyone would like to think they won't need parts... but when you do, you don't want to wait one to two months from overseas! Also, please review the TECH SUPPORT menu of our website for information related to your North Wing aircraft. If you cannot find the info needed for your trike or wing there, please feel free to call one of our dealers or the factory if needed. We know you will be thoroughly pleased to own a North Wing product. No expense is spared to get you a confidence-inspiring aircraft that you can be proud of. 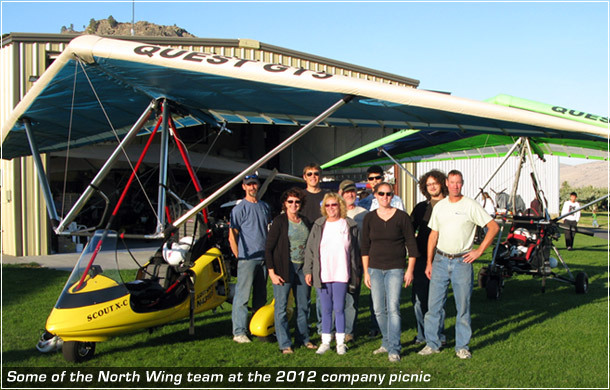 We're looking forward to having you on the North Wing team - flying the very best Light Sport Aircraft, Ultralight Trike, Wing, or Hang Glider, and proudly Made in the USA! Best of Flights and Regards - North Wing Celebrating 20 years of making Flight and Dreams come together!